Sony usually uses CEATEC in Japan to show off brand-new technology that the UK won't see for years, but the company choose this year's show to give more of in-depth look at its already announced Ultra HD home projector, the Sony VPL-VW1000ES. 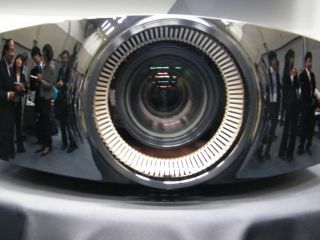 Shown off originally in September at IBC and CEDIA, the projector was announced but kept under wraps so it is nice to see the thing out in the open – and TechRadar was in Japan to get up close with the projector. Sony has a long history with 4K cinema projectors. This is the company that kick-started 4K projection around the world – with 10,000 units sold and myriad digital movies now filmed in the format. Knowing that this tech is coming to the home is something pretty special but as you can see from the images, you will need a pretty big lounge to house the device. According to Sony, the VPL-VW1000ES is 4K with a resolution of 4,096 x 2,160. When it comes to brightness, there's 2,000 ANSI-lumens on board and, using Iris3 tech, it has an 1,000,000:1 dynamic contrast. Features on the VW1000ES projector include something called 'Reality Creation' – this is essentially an upscaler for 1080P content so you can watch Blu-rays in upscaled 4k. This is handy, given that there's no content around for the device as of yet. The projector can also display Full HD 3D and 4K upscaling of 3D movies. The Sony VPL-VW1000ES 4K projector release date, in Japan at least, is mid-December, with pricing set at 1.68 milllion Yen – which equates to a bank balance sapping £14,000. We're thinking this will be around £20,000 when it is released, however.